Submitted by Relak Traven on 2019-03-28 07:53. Histories of the desert people tell of a star that fell from heaven long ago and touched the earth, creating a great explosion that laid waste to the lands. After the fires had gone out and the smoke had cleared over the formerly green and vibrant land, there remained only a bleak crater and miles of waste on all sides. Despite the empty, unforgiving landscape all around the crater, the location still drew visitors. The first to explore the hole in the earth reported unexplained phenomena and haunting images, but couldn’t specify a source. Neither arcane nor divine magic (or even psionic emanations) seemed to radiate from the basin, yet clearly some strange force was at work. An enterprising wizard named Ammavaru, whose many interests included the celestial sphere, financed a larger expedition. Ammavaru and her large family of sons and daughters headed to the basin to set up a permanent outpost. The story circulated that she hoped to mine the crater and nearby areas for residual starmetals, from which exotic alloys and pure metals are sometimes smelted and refined. Unfortunately, things did not go well for Ammavaru. Mining implements broke on a regular basis, for no reason anyone could immediately determine. Work animals and slaves were given to sudden panics, and everyone reported dreams of ever-increasing dread, usually involving a slow death from being buried under a crushing weight of tiny sand particles. One day, the reports from Ammavaru back to her financiers simply ceased. The courier assigned to run messages never returned, and new couriers hired by the financiers also failed to return. Eventually, Ammavaru’s venture was written off as a costly loss, and the location was forgotten. 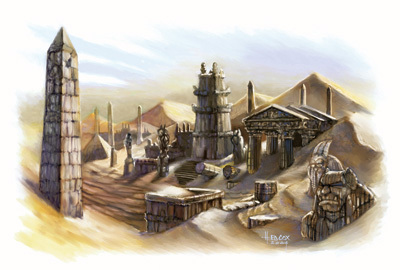 This is a 5th level encounter area, taken from the Sandstorm sourcebook. As such, it features landscape and heat dangers, some skill use, limited resting, and reasonable combat. It is also short, and can be completed in an hour or less. The game crashed repeatedly upon selecting new character or a pregenerated one. Probably has to with PRC. Also try to pack .mod files into .zip or .7z. Otherwise it will be hard to download for many users as browsers think it's a movie format and try displaying it. PRC requires skills.2da in override or pressing the reset button before character creation. NWN doesn't allocate enough skills slots into the .bic file otherwise. I have put the file in override and it didn't work, but your solution works! Thanks! EDIT: The areas are well detailed and narrated. In the end I couldn't levelup my psion, tried psychic rogue, it crashed, tried bowman managed to level it up to 5th level via console. Unfortunately the blazing sun is overpowered and not only saps dex and str but also slows down PC to almost standstil. I don't know whether the script is broken but it launches way too often with way too much negative effects. AFAIK no areas give you shelter from that effect - smelter should, cave should (there is mist there). I can't count how many times I have died and resurrected self via console. The encounter were also overpowered as I had no gear with me other than starting gear. Some critters could not be harmed at all. 2 doors in smelter are locked with way too high DC. Humanoid appearence is wrong and they are not named (though it might be due to some override files of mine). Never found the ores that the expedition mined.